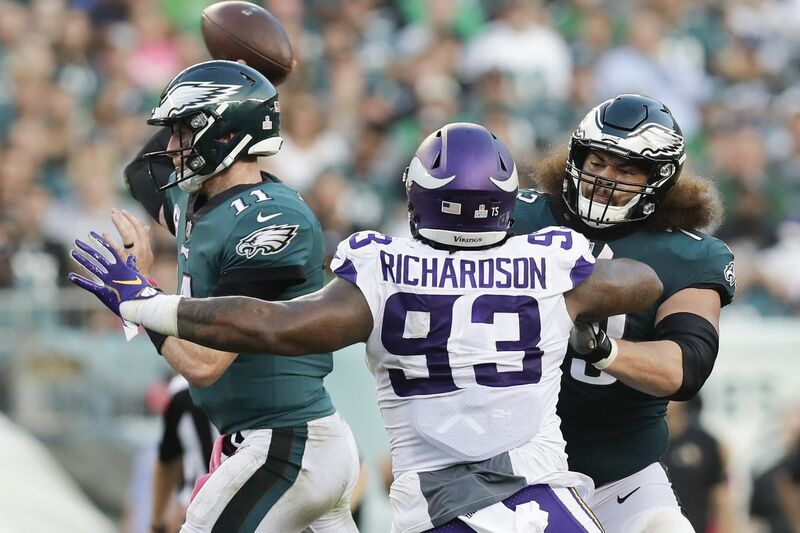 Carson Wentz throws the football as offensive guard Isaac Seumalo blocks Vikings tackle Sheldon Richardson. It was Seumalo’s first start of 2018. Isaac Seumalo started at left guard and Avonte Maddox started at safety, representing two notable lineup changes the Eagles made in the 23-21 loss to the Minnesota Vikings on Sunday. Seumalo replaced Stefen Wisniewski, who started much of last season and was on the offensive line during the Super Bowl run. "In fairness [to] both Isaac and Stefen, I want to make sure that we evaluate the film on this, and it's going to be hard, though, because it's a short week, short turnaround, and we're on to the Giants," coach Doug Pederson said. "I thought initially, [Seumalo] played well. …We'll evaluate it again and make the decision moving forward." Seumalo, who gave up a sack on the first series, declined to speak with reporters after the game. Wisniewski learned of the move earlier in the week, but he did not divulge why the Eagles made a change. "I'm going to be honest: I've been playing pretty well," Wisniewski said. "I really don't think that was it. I have some theories, but I'm not going to share those publicly. … It's frustrating. If I wasn't a Christian, I'd probably be losing my mind. But I always trust Jesus is in control." Seumalo was a third-round Eagles draft choice in 2016, the first player they drafted after Carson Wentz. There is pressure sometimes in organizations to play high draft picks. Maddox played ahead of Corey Graham. Defensive coordinator Jim Schwartz had hinted that Maddox would play more and Graham would not take on his Week 4 workload. Graham returned to three-safety packages, although he was limited on Sunday by a hamstring injury suffered during the game. Defensive tackle Haloti Ngata was inactive because of a calf injury. Ngata did not appear on the injury report until Friday, so the injury likely occurred then. The Eagles used Destiny Vaeao and Treyvon Hester as their other defensive tackles. Hester made his Eagles debut, as did fourth-round rookie defensive end Josh Sweat, with defensive end Derek Barnett (shoulder) sidelined. Running back Corey Clement was active but he did not play after not practicing all week with a quadriceps injury. The Eagles' other inactives were offensive tackle Jordan Mailata, guard Matt Pryor, running back Darren Sproles, quarterback Nate Sudfeld, and guard Chance Warmack. Wendell Smallwood dropped a crucial third-down throw but again made the most of a limited rushing role, gaining 27 yards on three carries. He noted that the Eagles are "just tired of beating ourselves and losing to teams that we should beat. … If we keep doing it, we're going to keep hearing it." Cornerback Sidney Jones went down late in the game grasping his left ankle, the one with the repaired Achilles' tendon, but Jones eventually was able to walk off the field. After the game he said he had just twisted his ankle. Jones seemed to be walking normally. … Carson Wentz was able to connect with Alshon Jeffery just twice, on eight targets, for 39 yards. … Eric Kendricks, brother of former Eagles linebacker Mychal Kendricks, recovered Jay Aajayi's red-zone fumble. … Brandon Graham had the Eagles' only sack of Kirk Cousins, though Fletcher Cox was credited with four hurries. … The Eagles took eight penalties for 52 yards, the Vikings just four for 23. … The Vikings' Adam Thielen became the first wide receiver in the modern era to record at least 100 receiving yards in each of the first five games to start the season. He caught seven passes for 116 yards, 68 of them on one sideline bomb.